Theses cases are now linked to ‘torture’ elsewhere, including this week’s reports by the US Senate into CIA behaviour and to the Brazilian Truth Commission. It is being posited the use of torture by the US did not only involve many of the ‘five techniques’ inflicted on the hooded men, but the Ireland v the UK case was heavily relied upon in the Bush administration’s infamous ‘torture memos’. When cited to the Strasbourg courts 1978 it was ruled that whilst the five techniques constituted inhuman degrading treatment they did not reach the threshold for torture. Essentially, the case was used as allegedly used as legal cover to argue that the US’s actions did not constitute an international crime of torture. The urgent need to revisit the Ireland v UK case therefore goes well beyond the important need for justice for the ‘Hooded Men’. Reports of the final report of the Brazilian Truth Commission on violations committed mainly under 1964-1985 military rule, include reference to testimony from former Colonel Paulo Malhães. The Colonel detailed to the Commission how he had tortured many victims, and gave details about training on torture techniques he and others had received in the UK. A section in the report entitled ‘UK collaboration’ highlights the Brazilian military’s admiration for British ‘interrogation’ methods, especially the UKs ‘clean torture’ techniques. Colonel Malhães particularly admired the ‘psychological torture’ which was known as the ‘English system’. The Guardian reports, that the Commission quotes former General Hugo de Andrade Abreu as saying in 1970 he and a group of the regime’s officers travelled to England to be trained on the ‘English system.’ It is claimed these techniques were then put into practice in Rio Army HQ in 1971. An army psychiatrist, Amílcar Lobo, who worked in a torture centre known as the ‘house of death’, is quoted as stating that the torture methods were “variations on the techniques used by the British army against Irish terrorists”. The Commission concludes torture persists as the crimes committed under military rule were never properly investigated and remedied. The new evidence which prompted Ireland to revisit this matter leads one to wonder how will the UK government react? It would be challenging to try to argue ‘argue torture is not torture.’ Case law has moved on and nowadays it is all but inconceivable to think the ‘five techniques’ would not be considered torture. London could of course hold up its hands and be held to account for past actions. Alternatively it could try and find a technicality to get out of the case or pressure the Dublin government to withdraw. So what did the UK government do last time round? One official document from the archives, entitled ‘Irish state case at Strasbourg: the next stage’ reveals that among the retaliatory measures considered were: economic sanctions, stripping Irish citizens of the right to vote in UK elections, changing nationality law to prevent Irish citizens from being British citizens, taking Ireland to the UN and even taking a counter case to the European Court of Human Rights against Ireland on matters such as “their prohibition on divorce and birth control”. It is in the section of the paper entitled ‘Possible pressure on the Irish’ that other options are considered. Economic sanctions are mooted but considered ‘difficult’ to devise in a way that hurt Ireland more than the UK, and that would not break EEC rules. Removing Irish citizens’ entitlements to British citizenship was a ‘possibility’ but considered an ‘empty gesture’. In short HMG appears to feel no one would care. A similar attitude was taken to removing the right to vote of Irish citizens in UK elections, which was equally considered unlikely to persuade Ireland to withdraw the case. Also considered was taking Ireland to the International Court of Justice (ICJ) or UN and accusing Dublin of allowing its territory to be used as “a base or place of refuge for terrorists mounting attacks on another country.” Whilst the UN route was felt to have ‘some propaganda advantage’ this consideration was outweighed by the risk of internationalising the Northern Ireland conflict, when the London government had ‘hitherto maintained’ it was an internal affair. Similarly with the ICJ, Ireland was not then party to the court. Submitting an application and mounting ‘a propaganda campaign’ to argue Ireland’s non-response as ‘an admission of guilt’ was considered but overridden by concerns it would bring the ICJ into disrepute and would in any case, not result in Ireland withdrawing the case. The same was felt of a counter case to the European Court on Human Rights on matters ranging from the prohibition of divorce and birth control, censorship and ‘possibly’ religious discrimination. However, the UK was concerned this would be “widely regarded as a petulant and irrelevant tu quoque provoked by our chargrin at facing more serious charges”. In plain language they were worried it would just look like sour grapes as London was in the dock for torture. Meanwhile as the talks go on at Stormont, the only threat of UK economic sanctions of which we are currently aware is for not implementing welfare cuts. 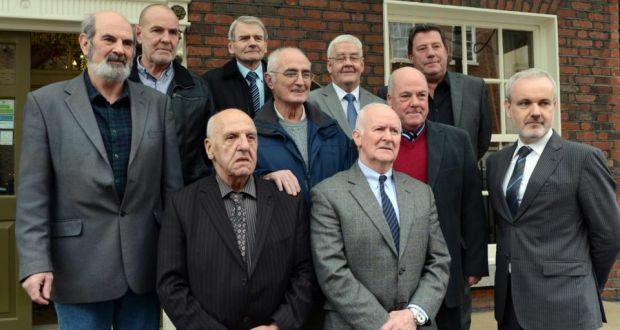 We don’t know if London has raised the reopening of the hooded men case with their Dublin counterparts. What would be of concern is if the UK and Irish governments, alone or together, sought to water down even the mechanisms set out in the Haass-O’Sullivan Proposed Agreement. Families are clearly concerned at delays and any threats to legacy inquests that Haass was clear should be retained. Even more concerning would be any attempt to introduce ‘national security’ limitations on independent bodies dealing with the past, which in effect is increasingly code for preventing the investigation of human rights violations by the state. Unless states are held to account for human rights violations history shows they have a habit of recurring. This is what happens in war, to quote the leader of the republican movement.